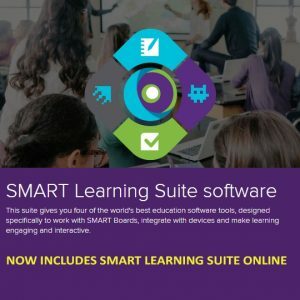 SMART Learning Suite combines lesson delivery, assessment, student collaboration and game-based learning software into one ultimate education suite. It connects students, teachers and devices to turn lessons into enriching learning experiences. SMART Learning Suite includes SMART Notebook, SMART lab, SMART response 2,SMART amp and SMART Learning Suite Online. The world’s premiere education software, SMART Notebook facilitates engaging and interactive learning experiences while providing the flexibility to respond to the needs of learners in real-time. The SMART Notebook Maestro add-on lets you control and interact with lessons from anywhere in the classroom. The add-on is free but you’ll need to purchase the Notebook for iPad app to run it. Run Notebook from your iPad, get one-touch access to formative assessments, easily create activities, record your lesson and embed YouTube clips in lessons. These are just some of the incredible features and integrations offered in Notebook. The greatest gift we can give teachers is time. For students, it’s more fun, engaging activities. SMART lab does both by letting teachers create game-based learning activities in less than 5 minutes. Whatever the subject, whatever the grade or skill level, customizable templates ensure content stays teacher defined and pedagogically sound. Add game components like timed challenges, ‘spin the wheel’ participation and others to keep energy high and minds engaged. Students can use interactive displays, desktop computers, tablets or laptops or any other student device to complete the activities you create, meaning every student can engage in the lesson regardless of their device. The visual appeal of the activities is not lost on students. The high-quality graphics keep them engaged and having fun and sound effects reinforce their decisions. SMART response 2 is formative assessment software for use on student devices that allows you to create a question set to complement your lesson in under 5 minutes. SMART response 2 is that intuitive. Access response 2 with one click from SMART Notebook. Drop your SMART lab questions into response 2 and vice versa. Generate a report immediately, so you instantly know whether students have understood, and export it for later use. All students start assessments at the same time, when you’re ready. SMART Learning suit online lets teachers open SMART Notebook lessons anywhere, and share them to any student device. With lessons on phones, tablets and PCs, students complete interactive assignments – and learn at their own pace. Teachers also gain valuable insights with real-time formative assessments. It’s a whole new way to spark active learning and encourage your students to challenge themselves.